Researchers have discovered breakthrough advances in antitumor immunotherapy in the wake of an eye-opening study showing how spirulina extract activates natural killer cells to destroy tumors. Natural killer cells are the body's rapid responders when cells are under attack from virus or tumor formation. These unique cells can recognize viruses and tumors in the absence of antibodies and signal molecules, making them a potent innate immune system defender. NT cells are also great communicators, regulating interactions with macrophages and dendritic, endothelial and T cells. They possess the unique ability to limit or increase immune responses. Learning how to make these cells work is critical for helping people control inflammation, autoimmune disorders and tumors. In a study from the Department of Microbiology and Immunology at Hokkaido University in Japan, spirulina extract was found to excite antitumor natural killer cell response. For their study, the researchers transplanted tumors into a specific species of mice. After orally administering hot water extracts of spirulina to the mice, they watched for molecular signals in the major histocompatibility complex of the mice cells. At first, a sub cell line showed slight expressions of NT response, but as the study furthered, they noticed natural killer cell activation signals going off through expressions of Rae-1, a ligand for NK activation. With natural killer cells now arriving onto the scene of the tumor-ridden cells, the implanted melanoma slowly regressed, until the natural killer cell defense effectively eliminated the entire tumor. Molecular communications with in vitro bone-marrow-derived dendritic cells showed further natural killer cell activation properties that were derived from the oral spirulina treatments. Furthermore, through studies of cellular communication, the researchers noted that spirulina enhances NK activation against tumors through one specific pathway in the mice. A specific immune cell also worked in coordination with spirulina to exert synergistic antitumor activity. This BCG cell wall skeleton worked with spirulina to boost IFN gamma production, strengthening antitumor potential. When the two are used simultaneously, natural killer cells increase down the specific MYD88 pathway, creating an antitumor immunotherapy advantage. Spirulina's antitumor capacity is just another credential to its long list of health benefits as a superfood. Loaded with all eight essential amino acids, B vitamins and antioxidants like zeaxanthin and beta carotene, spirulina is indeed an immune system booster. With essential fatty acids like linolenic acid and probiotic strains, it's no wonder why tumors cannot coexist with spirulina. Full of chlorophyll and phycocyanin, spirulina is also a potent blood purifier, helping transport oxygen to cells, as it promotes blood cell growth and rejuvenation to the body's existing supply. Spirulina also helps detoxify the body in a major way, moving out metals like mercury, arsenic and cadmium that can accumulate in the soft tissues and compete with minerals like calcium for absorption. As spirulina moves the bad out of the body, letting the good in, it is indeed a miracle in itself, also containing nearly 70 percent protein - more than any other food yet discovered. 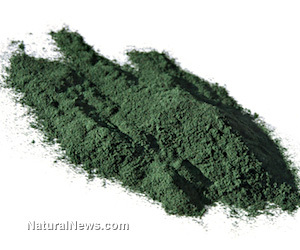 Daily consumption of this blue green algae leads to an influx of life-giving phytonutrients that promote mental clarity, energy and stamina in times of mental and emotional stress. There really isn't a reason not to consume this wonderful algae. As scientists begin to understand spirulina's immunotherapy benefits, including its ability to eliminate tumors, how long will it be before the medical establishments puts down their radiation equipment and starts attacking cancer at its roots? As a matter of fact, now is a great time to stop running around in pink ribbons, pink shirts, slogans and pink underwear. It's time to start standing up to the cancer industry. Talk to your doctor, your friends, your family about the antitumor, natural killer cell-stimulating properties of the nutrient-dense, blue green algae called spirulina.